In 1989, television producer David Sams approached Bill Griffiths, Sr. with the desire to showcase Roller Games to a national TV audience. You may not know who David Sams is, but you certainly know his work. Sams worked at King World, the powerhouse production company responsible for launching the syndicated versions of Wheel of Fortune, Jeopardy!, and The Oprah Winfrey Show. Sams was directly involved with bringing these shows to modern TV audiences of the 80s and 90s, and would have a lasting legacy in the television industry for those accomplishments alone. But the David Sams TV show that will forever live in infamy is Rollergames, the most ridiculous, most outrageous, most over-the-top sports entertainment phenomenon that the world had ever seen. At its peak in the early/mid 1970s, Roller Games was like wrestling on wheels. But in Rollergames, it became war on wheels.1 It was like nothing else before it and nothing else that was to come after it. Like the Roller Games shows of decades past, the primary purpose of Rollergames was to entertain. It wasn’t a sport, just a television show masquerading as one. To facilitate this, there existed its own reality, a reality that was believable enough for audiences to accept what was given to them in the name of a good show. One of these realities was the fact that the game being played was a competition between two teams. This competition had rules, and within these rules points were being scored and a winner was declared at the end of the game. It smelled like sports, it looked like sports. So why not go with it and put on a good show doing it? The “sport” of Rollergames2 had a structure. But since the show was all about entertainment, the play on the track was merely the ways and means to advance along the various storylines and feuds in a convenient, ratings-grabbing way. Really, the “rules” of Rollergames aren’t really rules at all, but merely justification for why the game was played in the way that it was. However, there is something to appreciate here beyond the ridiculousness of the theatrics, if not the competition. 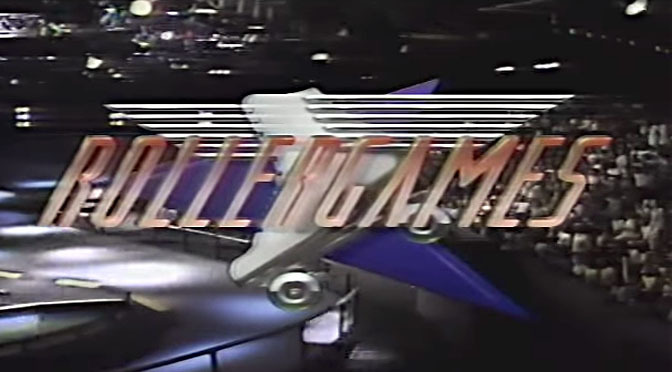 The fact is, Rollergames was so ridiculously awful, it was ridiculously awesome. So here was the unreality that Rollergames created for itself, starting with its theoretical rule book. Look out for the bold and underlined passages, which will be primers on the next chapters. The Super Roller Dome, with Rollergames’ over-the-top figure-8 track. Track – Rollergames is played on a custom-built, one-of-a-kind figure-8 track. The lower loop, also known as the main concourse, is banked except for the intersection point, which is flat. The start area is located just before this flat section. Team benches and the alligator pit are located in the infield of the main concourse. The penalty pods are located in the outfield below the lower loop. Extending off the start line and leading into the upper loop of the track is the Jetway, a straightaway that leads directly into a steeply-banked, 14-foot high turn called the Wall of Death. Two lines, marked at 10 feet and 12 feet high above the stage floor, divide the wall into multiple sections for scoring purposes. Completing the upper loop is the Jet Jump, a two-foot high jump ramp. A line on the track, located 12 feet past the launch point of the jump, is used to determine jump distance for scoring purposes. The jump directs players back into the banked section of main concourse in the lower loop, where they rejoin behind the pack skaters. Structure – Games are 24 minutes long, with four 6-minute periods. Once started, the period clock does not stop. Men skate in the 1st and 4th periods. Women skate in the 2nd and 3rd periods. The team with the highest point total at the end of the game, men and women combined, wins. At the beginning of a period, players begin from a standing start on the main concourse, with blockers up front and the jetters (jammers) a few feet behind. During subsequent cycles in a period, blockers and jetters begin from a rolling start near the start line. Play begins on a single whistle. The cycle ends when 45 seconds have expired or the lead jetter ends the cycle. Blockers – Blockers do not wear helmets.7 On the first lap, they assist their jetters by whipping them into the jetway in an attempt to earn a better score on the Wall of Death. On subsequent passes, they attempt to help their jetter score and prevent the other jetter from scoring on them. Helmet Restrictions – The jetter wears the only helmet a team has. They only need to start the cycle with their helmet on; should they lose it during the course of the cycle8 they need not replace or retrieve it to still be eligible to score points. The Wall of Death – Points are awarded based on how high up jetters can get on the 14-foot tall Wall of Death. Two points are given for getting above the lower, 10-foot line. Six points are given for getting above the higher, 12-foot line. To be eligible for points, skaters must take “three big strides” above the appropriate scoring line. Individual points – Jetters can also score individual points by passing opposing players after coming back on to the main concourse. One point is scored per opponent passed, per lap of the pack. Right, so those were the rules of Rollergames, the “sport.” Screwy, ain’t it? Ah, but there’s a bit more to this than just how the game was played on the figure-8 track. Much like professional wrestling, Rollergames had its own reality, and for that reason they were able to create “rules” within that reality. Whereas some of these things would be ridiculous in real life, let alone real sports, within the universe of the TV show it was perfectly normal. For example, two of the show’s running controversies centered around key players on the T-Birds. The infamous Miss Georgia Hase protested that “The Living Legend” Ralphie Valladares could not be voted into the Hall of Fame unless he hung up his skates for good. As the best player on the T-Birds, losing him to retirement would, conveniently, make the T-Birds more vulnerable to losing to the same “bad” teams that want to see him retire. Another major angle the show used was the plight of Jennifer & Kristine Van Galder, the “T-Bird Twins.” The two were “drafted” onto the T-Birds as one player11 but not all were pleased at this, feeling they were drafted “illegally.” Of course, only the evil teams were upset over this, so they “convinced” the Rollergames commissioner12 to reverse the decision, forcing them to be split up and—get this!—be placed onto two of the “evil” teams. Hilarity ensued as the twins’ new teammates looked like they wanted to kill them and their new (evil) managers made advances on them, all while the announcers were beginning to fear for their personal safety. Stuff like that would fit right into the world of WWE wrestling, where the whole business model of sports entertainment is to give people the storylines for free but save the climactic endings for the pay-per-view events where you had to shell out some cash to see the good stuff as it happened. Rollergames pretty much did the same thing, but on a smaller scale: It was decided that the only way to settle these “controversies” was to let the public decide whether or not Ralphie should get into the Hall of Fame or if the Twins should get to go home to the T-Birds. For a couple of bucks a minute, you could call a 1-900 number, “talk to the T-Bird Twins” (ahem) and vote on the fate of the T-Birds. Of course, the public sided with the good guys. The Rollergames reality went a step further with the show’s extremely high production values. If someone didn’t know any better, they might see an episode or two and think that this was a real sports league. Episodes featured pre-game discussion; a halftime show with league news, highlights, and interviews; a trackside reporter that did in-game interviews; and a postgame show that often featured a musical performance. But even this angle of reality was poked fun at. The halftime show host was, famously, Wally George, a conservative commentator in the ilk of Rush Limbaugh. He often recited essays he called his “Rollerbeef” in which he disapproved of everything from how the evil teams were trying to manipulate the league to their advantage, to how the alligator pit is sullying the sport from “being the pure game it is intended to be.”13 Even though the alligator pit is actually how the game was intended to be. It’s stunts like this that made Rollergames a ratings smash—the two-hour premiere episode got almost double the ratings of syndication powerhouse American Gladiators. The show got so popular so quickly, in fact, that a whole slew of merchandise was created for the series. There was Rollergames the Magazine, Rock ‘N Rollergames the soundtrack, Rollergames the NES game, Rollergames the arcade game, and even Rollergames the pinball machine—all of this spawning from the wild success of just a few episodes. But unbeknownst to anyone at the time, jumping over the Wall of Death turned out to be the moment the show jumped the shark. The production costs may have been too much for some of the show’s producers, who soon after starting declared bankruptcy. This forced Rollergames to come to an abrupt end after only a single, uncompleted season. However, not one to let a dozen or so episodes of comedy gold and a spectacular figure-8 track go to waste, Sams and Griffiths got one last oomph out of Rollergames. Though production of new episodes ceased, the Super Roller Dome remained open for public shows. Existing episodes of the show were repackaged for international distribution under the still-viable Roller Games International brand name. These episodes differed from the American syndicated version, in that they featured a different studio host and announcers, newly-filmed “locker room” skits to advance storylines, and an extended studio post-game show that put an emphasis on coach and player interviews. But with no new backers to revive production of the TV show, and not enough revenue coming back in from the re-purposed episodes and licensing deals, the prospects of new Rollergames episodes were killed for good in the early 1990s. The death of the TV show also signaled the beginning of the end for Roller Games. As the 1990s dragged on and the popularity of Rollergames the TV show began to fade into memory, so too did the prospect of seeing the L.A. T-Birds live. By this time, almost all of the T-Birds most popular skaters had retired or passed away, including “The Living Legend” himself; Ralphie Valladares died in 1998 after skating with Roller Games across five decades. The new blood that had been recruited had nowhere near the talent or experience as T-Birds legends gone by. The Griffiths and their cherished T-Birds gave it one last push in the 21st century. Bill Griffiths Jr., son of Bill, Sr. (and Rollergames TV coach of the T-Birds) attempted to relaunch Roller Games International in the year 2000. But with little capital and even less brand recognition, it went nowhere fast. In 2004, promoter Bob Sedillo leased the RGI and the T-Birds brands to attempt his own Roller Games comeback; after a disastrous clash with a legit-skating team from the modern era of roller derby and a few successful shows in the Bay Area, that too stalled out. Sedillo himself died in 2009, reverting the Roller Games brand and its iconic Los Angeles Thunderbirds back to the Griffiths family. It has remained dormant since. Although Roller Games looks like it may not be coming back anytime soon, the scripted, heavily-theatrical style of roller derby it pioneered still lives on today. American Roller Skating Derby, or the ARSD, is billed as the country’s only “traditional” professional banked track roller derby league. It’s where you’ll find the derby’s legacy teams like the Bay Bombers, the Red Devils, the Chiefs, and the Firebirds—a team that looks an awful lot like the T-Birds, right down to the green and gold uniforms. Unlike the failed RGI comeback attempts, ARSD is doing pretty well for itself, having survived 15 years and drawing crowds of up to 2,000 at some of their bigger events. It’s this stability that has drawn the veterans of Roller Games and Roller Derby, that still skate and staff the shows to this day, including third-generation skater Josh Valladares, son of Gina (who also skated on Rollergames with her father) and grandson of Ralphie. They’ve even managed to get new players to join the fray, albeit ones that still have a ways to go before they can get the same skating experience as their elders. But ARSD’s place in roller derby history is small compared to that of Roller Games when it was at its peak. The lasting legacy of Roller Games is that it cemented roller derby as a true “sports entertainment” platform in America and across the world. Many people today may see this as a bad thing, especially as the modern game is still trying to wash itself of its seedy past—a past that was effectively created by Bill Griffiths and his one-ring circus act. That doesn’t mean everything that came from the Roller Games era of roller derby should be looked upon negatively. It’s easy to not take the theatrical versions of roller derby seriously, particularly when you see the “fake” version of the game being played in today’s derby world of legitimate, amateur competition. But Roller Games was a world-wide phenomenon for a reason; you don’t get that popular that fast on fighting and hair-pulling alone. Before heading to Chapter 7, if you’ve never heard of or seen Rollergames before, here’s a full episode for your viewing pleasure. You can watch more episodes and clips from the show on the WRDN Rollergames YouTube playlist. 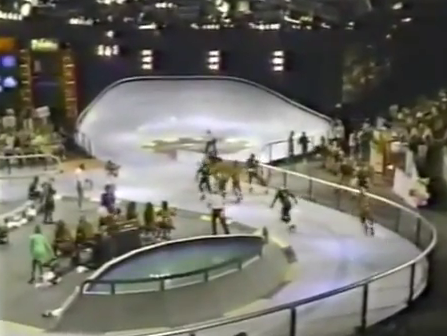 Quite literally: The “network” that fictitiously broadcast the show was the World Alliance of Rollersports—W.A.R. for short. A recurring theme among the announcers on the TV show was that they kept referring to the game as a sport in a serious, straight-laced manner. This is in contrast to the zany, non-sporting things that actually happened on the track. (Like alligator pits.) This irony was not lost on the show, which helped make it such a hoot. This made Rollergames a 4-on-4 game, which to my knowledge is the only form of roller derby (sorry—”roller derby”) that has ever had 8 players on the track at all times. In practice, the game clock was irrelevant, only ever used to dramatically count down the seconds in the final play of the game. Each period always had five cycles (jams) regardless of time on the clock. A televised game only went to sudden death once, which was during the premiere episode. However, the show was very clever in keeping the ruse up that it could happen again, and in fact had happened multiple times, using the halftime show as the ways and means of “reporting” that sudden death took place in “one of this week’s other games,” complete with highlights, and that the “ongoing controversy” over sudden death had no end in sight. It was a good way of getting mileage out of what was very likely only a single day’s shooting with the alligators actually on set. Personally, I’ve always found it more logical for a jam to end with a helmet tap rather than a hip tap. Jammers that accentuate hip taps by putting their hands near their head are kind of already doing this anyway, aren’t they? Which was ridiculously common, with all the elbows flying around. This only happened when the script dictated a team needed to make up a large points gap in a small amount of time, or when both players did it at the same time so as to humorously cancel the scores out. A fellow by the name of Bill Griffiths, Sr. This show is so meta.